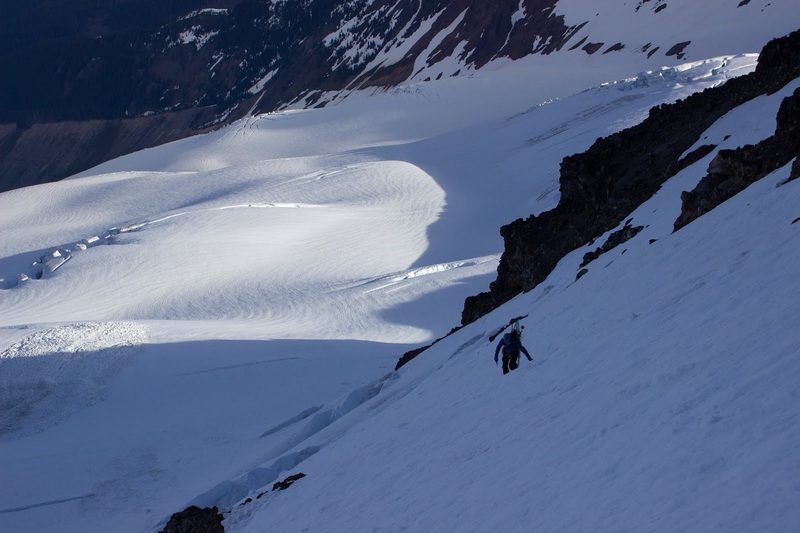 The North Ridge of Baker splits the Roosevelt Glacier and the Coleman Headwall, providing a moderate route to the summit with enough steep snow and technical ice to keep it engaging. Josiah and I paired it with a ski descent of the Coleman Deming for the most enjoyable day either of us have had on a volcano. We left Seattle at 6pm on Friday night under a low cloud layer. 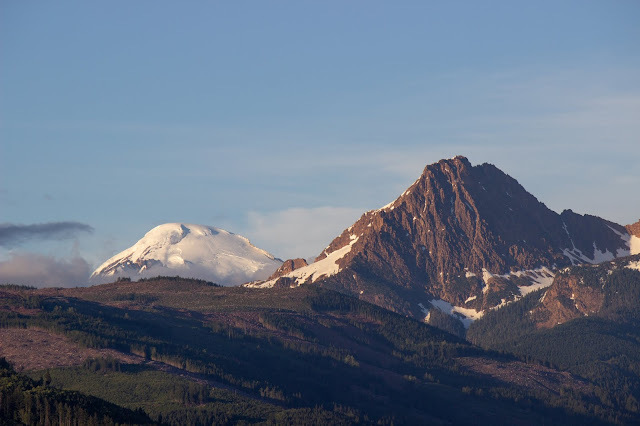 As we drove north the clouds dissipated and we were treated to excellent sunset views of the Twin Sisters and Baker. 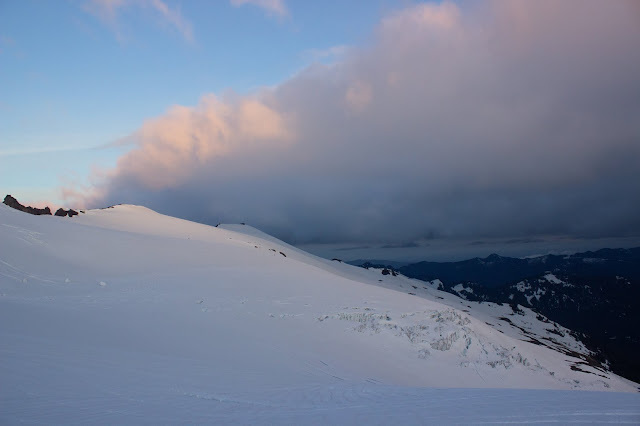 We made it to the Heliotrope Ridge TH as the sun set, which is about 9pm these days! We set up camp in the parking lot and tried to get some sleep under the full moon. After drifting in and out of sleep for a few hours the alarm went off at 2am. The hike to Hogsback went quickly in trail runners. The first stream crossing was covered in snow and the second was only halfway melted. 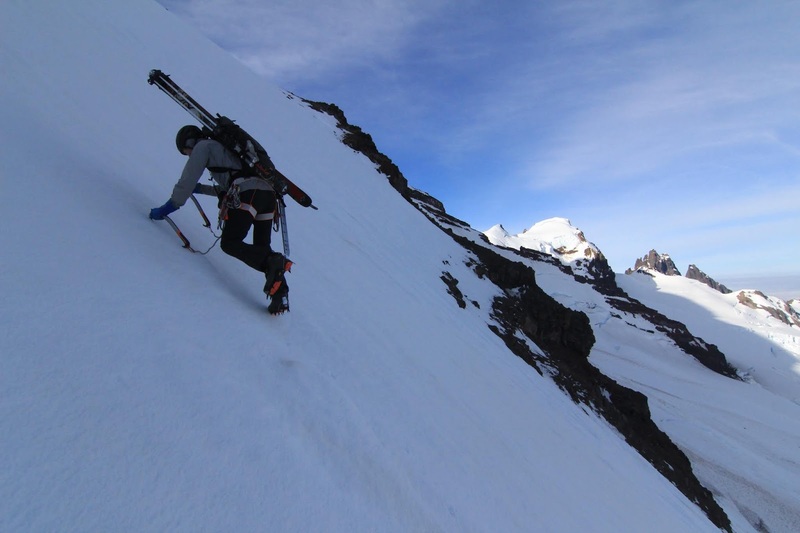 We stopped at 5,000' and switched to skis. It had been a cool night relative to the rest of this abnormally warm spring. There was a solid crust, perfect for ski crampons. 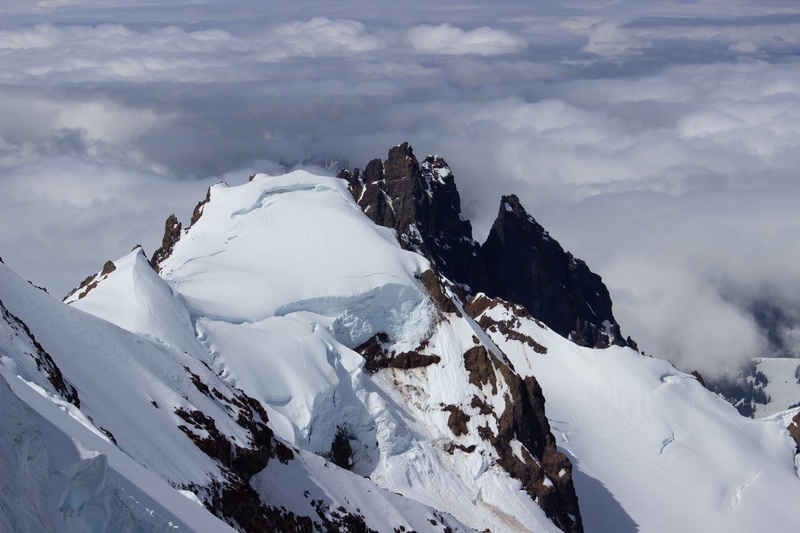 We skinned up to Hogsback Camp and then traversed towards Gargoyle Rocks on the edge of the Coleman Glacier. 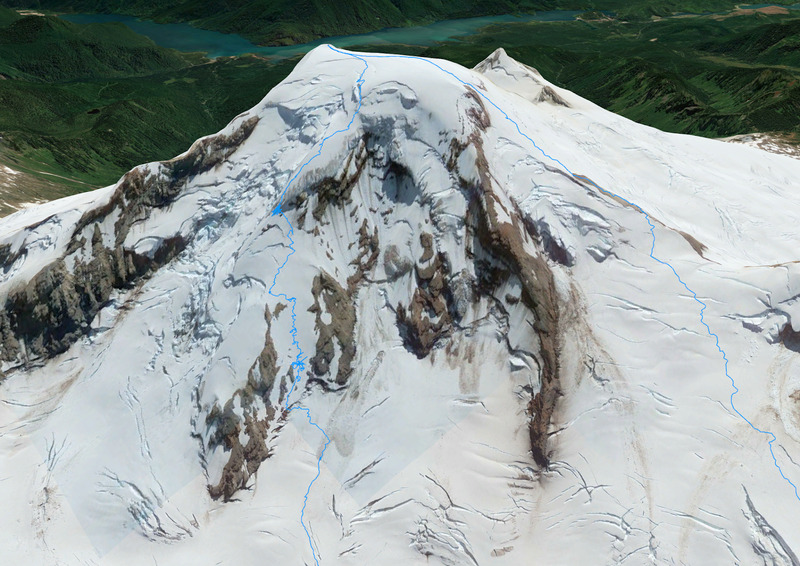 The Coleman Glacier is really filled in right now and didn't pose any routefinding issues. The only annoyance was the 2+ miles of icy sidehilling. 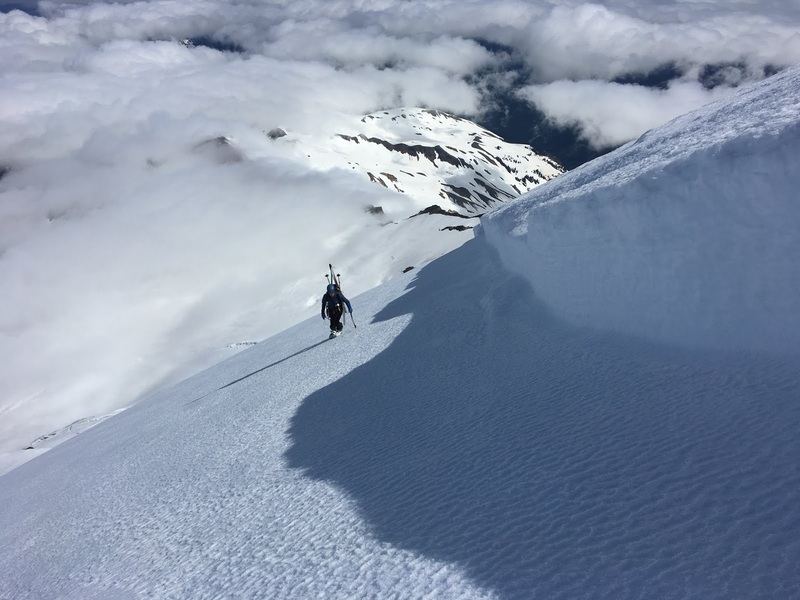 Instead of traversing all the way to the base of the North Ridge, we decided to take a more direct variation up a open snow slope. 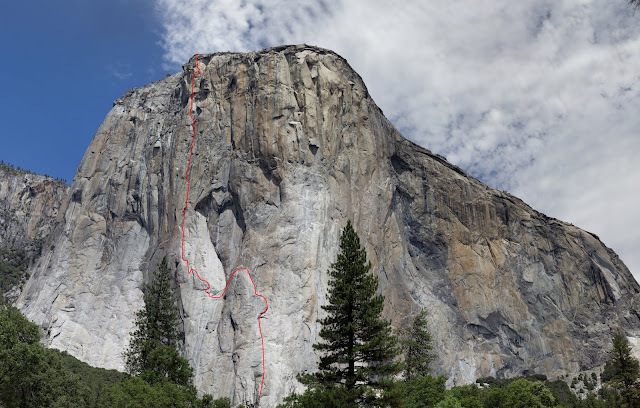 This route is steeper and more exposed to rockfall than the standard route, but we decided that it would be safe given that it was early on a cool morning. 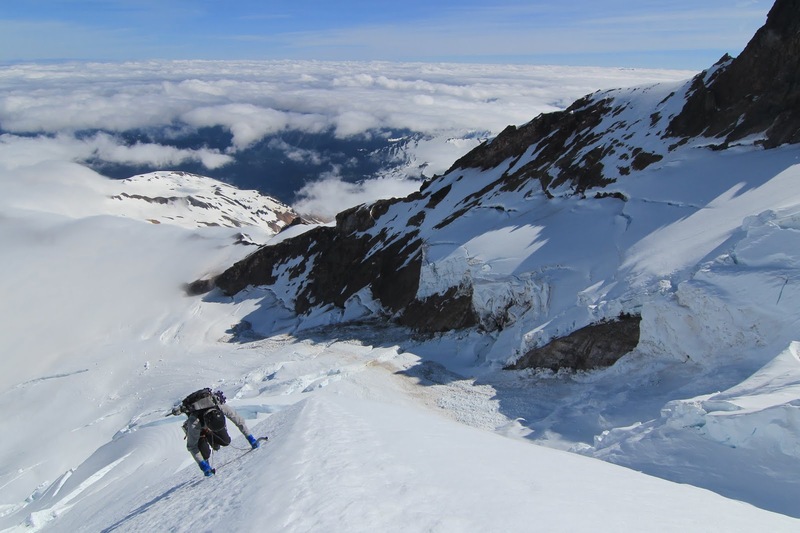 We stopped near the top of the Coleman Glacier to transition from skis to crampons. 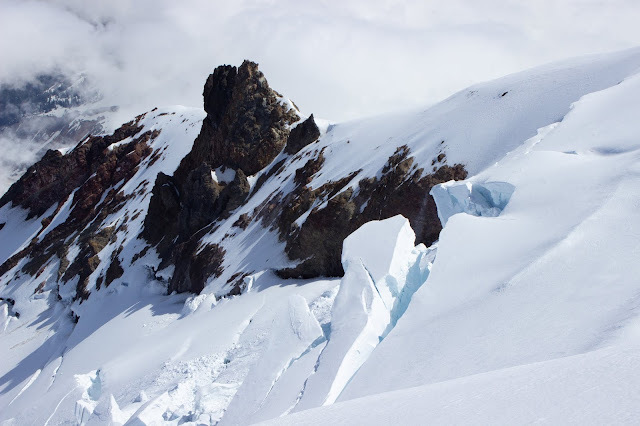 We crossed a massive slide that had flushed the Coleman Headwall and made a simple bergschrund crossing onto the face. We enjoyed well-consolidated ~45 degree snow up the face and joined the standard route after about 1,000' of climbing. I had been a bit anxious about the ice cliff all morning, but it wasn't as intimidating up close. We decided to take a line on the far left of the cliff. Josiah built a belay with an ice screw and a vertical picket at the base of the cliff. I climbed up a short section of vertical ice onto a small right-leaning ramp. I felt a bit rusty, having only climbed ice once since going to Hyalite over Christmas. Once on the ramp the angle eased but it was still a bit tricky with A-framed skis on my back. 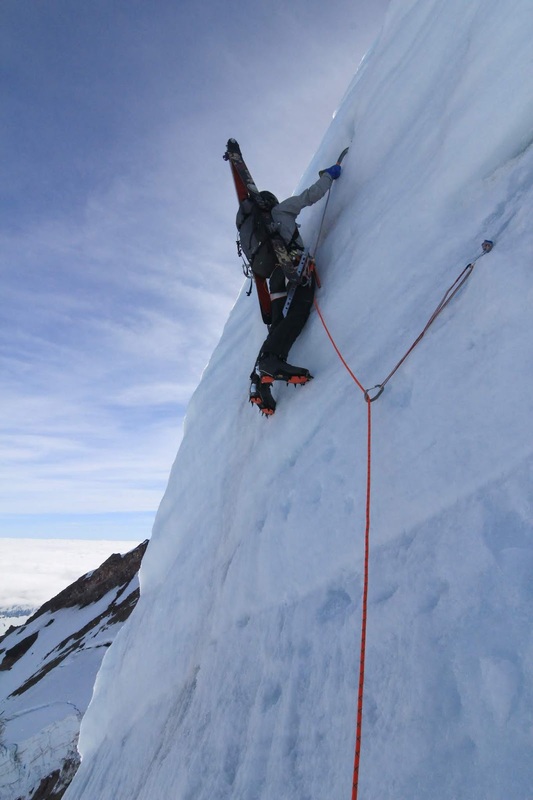 I continued up on easy aerated ice and then steep snow until the end of our 40m rope. I had saved a couple screws for the belay but they were of no use. The snow on top of the ice step was deep and sugary, so I spent a while deadmanning a picket and brought Josiah up. We unroped and continued up the ridge. 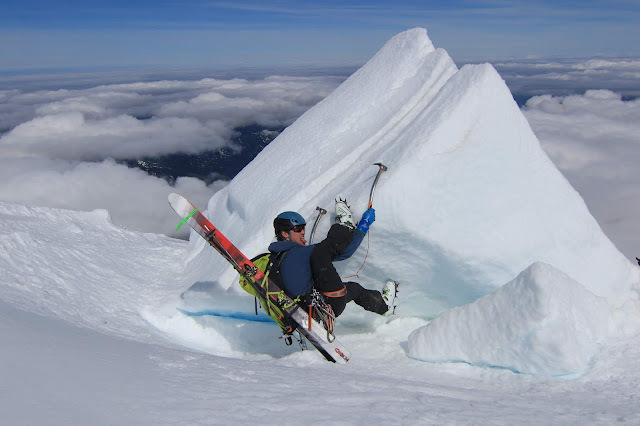 The position here is just incredible, with the ridge dropping away to the ice cliff below and the massive seracs of the Roosevelt Glacier to the left. 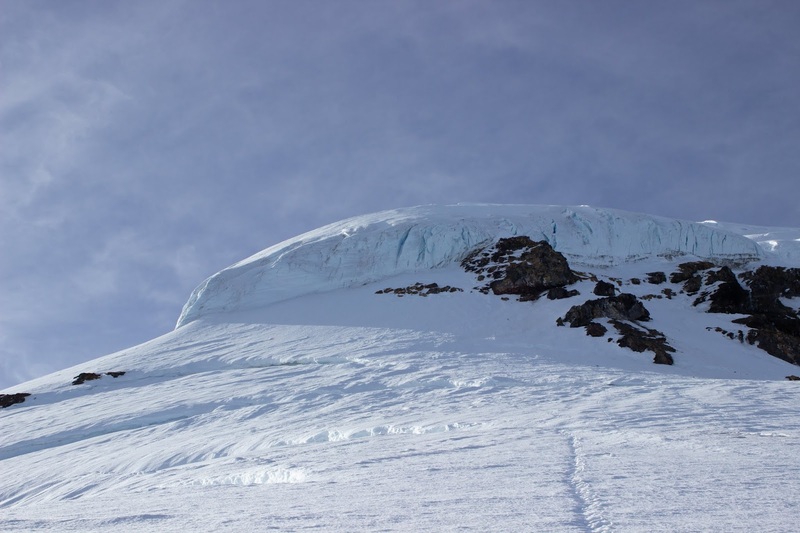 At about 10,000' the angle eased and we ran into a 3-4ft crown stretching across the width of the ridge. Judging by this trip report, the slide happened some time in the week before 5/20. Spooky. We traversed to the right over the bed surface to avoid standing on the hangfire and gained a nice plateau. We stopped to finish off our sandwiches and enjoy some serac bouldering. 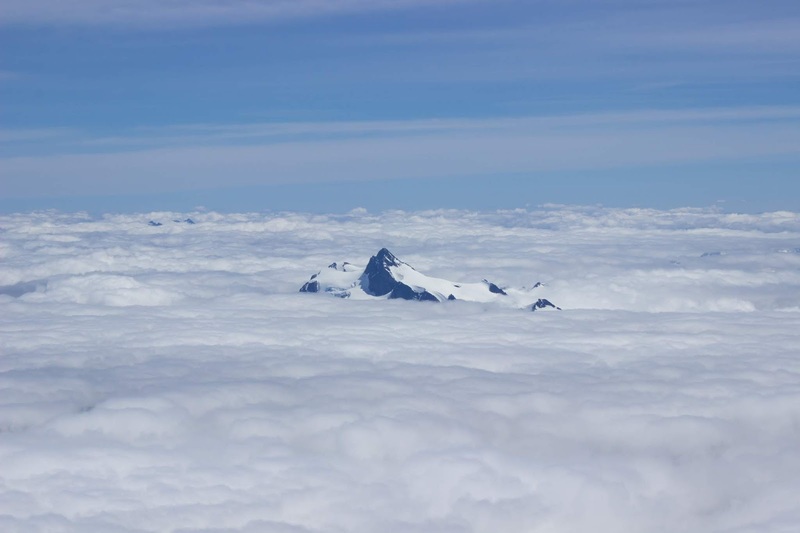 We booted to the summit and got some nice views of Shuksan and Glacier poking out above the clouds. I love being up high on days like this. It was just after 11am and parties coming up the CD told us that the Roman Wall was still quite icy but we didn't feel like waiting for it to corn up. We ate the rest of our food and dropped in. The snow was icy but smooth and made for some engaging turns. The Coleman Glacier is still in really good shape without many open crevasses. The snow gradually softened and turned into ripper corn at about 8,400’, then got mushy around Hogsback Camp but never turned into velcro. 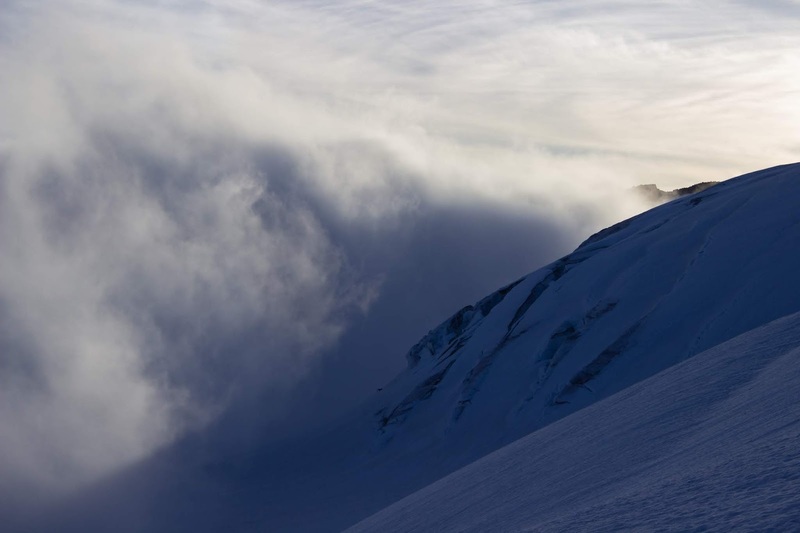 We picked up our shoes and skied down to 4,700’ for a 6,000’ continuous run. Not bad. We had a nice leisurely hike out, stoked on a smooth trip with some excellent climbing and skiing.